In case you are wondering who is that who is that cat? Let me introduce Tinka Tingle (lived 11 years}. 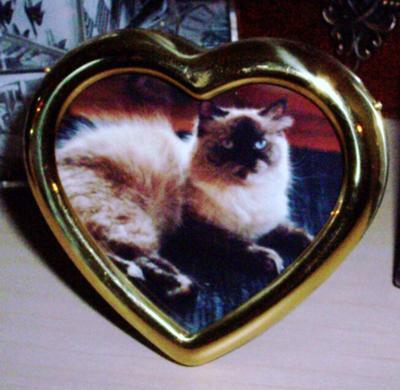 She was a Torte Point Hymie and the only pure bread cat I have ever owned. Tinka is named after a real person. I had never met her she was a friend of moms, in antiques i think ,but I was crazy about the name just like saying it Tinka Tingle. Tinka the human was quite honored to have such a beautiful name sake. I got Tinka as a companion for the love of my life Skyler (lived 18 years) another story. He deserved the prettiest girl. She loved to pose for pictures and preen and fuss over herself. Very much a lady. She would even model for me to sketch. Tinka walked with her tale down just above the floor curled up at the tip and never dragging. It was more like the train of a long dress flowing behind her. Not sure if it is common in the breed?? I have never seen another cat walk tail down other than when stalking. Comments for Who is that cat? Tuxedo cats are lovely tom cats in black and white. They're nature's variation of finesse and elegance. Definitely, tuxedos are continuously in a position for the following occasion. The website is totally my cat site.I love to read articles about cats and i have gain a lot of information about cats from your articles. Hi! Thanks for your great articles! May I share one of your articles on my site about Halloween Costume Ideas? After publishing I will link for you as an author! Thanks! Oh wow. So sweet and so beautiful. I love cats and i am really very happy to see your website because your website them and domain really very interesting. That's really an amazing website for cats lovers, they can get useful information about cats, their health issues, breeds etc. Our website www.ukessayservice.biz have all important sections, services as well. Beautiful baby, i had a tortie point years ago. Thanks for telling us about your baby, Tinka Tingle. She was beautiful and even in the photo its easy to see how special she was! Join in and write your own page! It's easy to do. How? Simply click here to return to Photo Submission.